In the next few months we'll be going through all products to ensure compatibility/ identify any issues that may exist. Most development at the moment is focused on complete ready-to-use Flash movies. First one will be an xml-driven photogallery. Beta is complete and running very well. More news will follow. 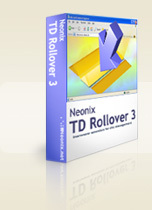 Neonix TD Rollover 2 - Our best selling extension - create table-based navigation by turning your table cells into rollovers - now with fading rollovers! $10.00 Learn More! Click here to make money off of our stuff! Looking for ideas? You'll find some cool applications for our extensions in here... all it takes is a little imagination!